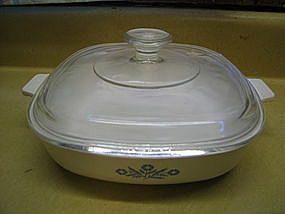 Casserole dish and lid marked as Corning Ware P-9-B 9 In. It holds approximately 1 1/2 quarts. There are no chips, cracks, breaks or rough rims to either piece. The interior of the casserole shows little usage marks. There are some small dark streaks on the exterior, toward the base, that will not come off with baking soda. It can be converted to use as stove top skillet with a Corning detachable handle. I have several of the handles available @ $5.00 with purchase of casserole. Other sizes of cornflower casseroles, as well as skillets, teapot and coffee pot are available. I need your zip code to calculate the postage.